Not only can wetlands not be built on but often different construction techniques would need to be used so as not to damage them, according to federal and state wetlands guidelines. 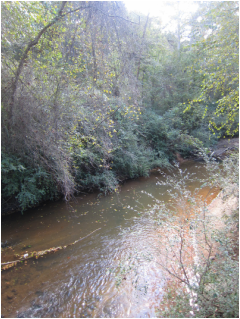 Sewell Mill Creek and the sandy beaches that people and pets play in next to East Cobb Park could all be negatively affected by such a large-scale project. Sewell Mill Creek actually runs the length of the southern property line, and 2 creeks from the Tritt property flow into it as well. The Isakson Living proposal has a 10-year build out plan, and such a long term construction project would adversely impact the creek itself as well as the sandy beaches. While we realize that any development on this property would cause some environmental damage, due to the especially large footprint of this particular development, we question how pollution in and around Sewell Mill Creek would be contained. Here is the map from the National Wetlands Inventory, and it shows Freshwater Forested / Shrub Wetlands are most likely located in the floodplain along Sewell Mill Creek. The reason that the wetlands are not specifically listed for the Tritt property on the current National Wetlands Inventory map is because the Tritt property has not been surveyed since the Wetlands Inventory began, as the Tritt property has been family-owned for over 100 years.